Crowd favourite Jimmy White reached the last 32 of the Snooker Shoot Out in Watford with a tense 32-18 win over fellow Englishman John Astley. White, at 56 the oldest player in the event, beat 11-time women's world champion Reanne Evans in the first round. Belgian Luca Brecel beat Ricky Walden with a 133 total clearance. His 14-year-old compatriot Ben Mertens lost to 16-year-old English left-hander Ryan Davies. Jamie Clark of Wales saw off Mitchell Mann, who was penalised for taking too long when he appeared to strike the cue ball before the 10-second klaxon sounded. Six-time world finalist White, who had not progressed beyond the last 64 this season before this week, won the most recent of his 10 ranking titles in 2004. "You think you're in control but a couple of times I lost the plot," said the world number 75. "Luckily, he missed an easy ball in the yellow pocket, otherwise I'd have lost." 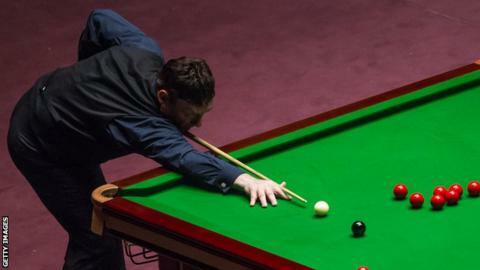 Amateur Steven Hallworth went through with an emphatic 120-8 win over world number 27 Tom Ford. In the evening matches, Stuart Bingham beat Shaun Murphy 72-22, Zhao Xintong overcame World Grand Prix runner-up Ali Carter and Barry Pinches saw off Ben Woollaston by three points in a frantic finale. Woollaston potted the pink before the end of match klaxon sounded, which looked to have earned him victory, but replays showed the brown ball was still moving and Pinches was awarded the match. Oliver Lines beat former winner Martin Gould but his father Peter missed a late brown and went out 17-13 to Welshman Jak Jones. Defending champion Michael Georgiou looked set to wrestle victory but missed a red into the corner and bowed out 45-28 to Li Hang. White will play world number 62 Rory McLeod in the last 32, with Davies facing Sunny Akani and Bingham meeting Kyren Wilson.